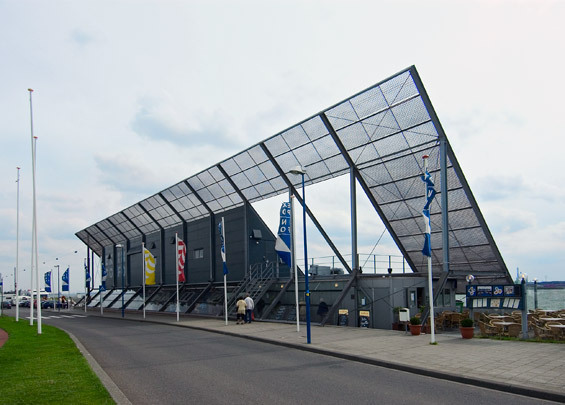 Built to celebrate the first 60 years of the Rotterdam Port Authority, this exhibition and catering pavilion stands on the New Waterway looking out over the shipping. Entirely composed of zinc-coated steel sheet and triangular in section, the building is dominated by a gigantic 65 metre long screen on the south side. There to shield off both sun and wind, this screen consists of steel grilles folded back at the windows to provide sun baffles. The large gap in the screen accommodates a raised observation platform with stairs that can double as tiers of seating.